Since my post in Autumn on the Obama health care plan a lot has happened. But perhaps more importantly, the EVENT hasn’t happened. No healthcare bill has been passed. A mojor reason for this is the impasse reached between the ‘House Bill’ Affordable Health Care for America Act and the ‘Senate Bill’ Patient Protection and Affordable Care Act. It would seem that this impasse may now be about to be … err… passed. As Obama has just published a new proposal which tries to satisfy the House and the Senate. Th differences between the three plans are detailed here. So on the strike wave in Britain…. 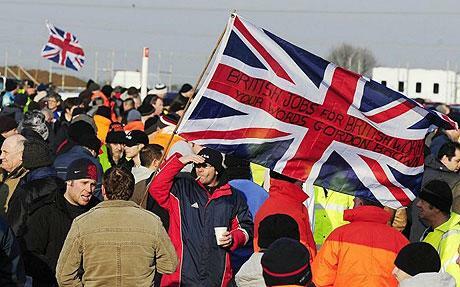 The slogan ‘British Jobs for British Workers’ has been raised. But as the flag says the extent of this nationalism is no further to the right than the jingoism of that is expected from Gordon Brown or anyone. And the extent of this nationalism is hard to measure. The British state and its media is deliberately excentuating the nationalism of the strikers in what would seem to be an attempt to portray them as the dangerous mob, the fascist horde. One shocking example taken from vimeo. Quotes from News At Ten and Newsnight (half an hour later), Feb 2 2009. The striker’s quote is edited in the News At Ten segment in a way that makes it seem he does not want to work alongside foreigners, in the context of a ministerial claim of xenophobia. In the fuller Newsnight report, it is clear that he is saying that he _cannot_ work alongside them, because they are segregated. The same man appears in the Six O’Clock News the same day, but the edited quote is not in that bulletin. BBC Strike News Selective Quoting from fridgemagnet on Vimeo. * No victimisation of workers taking solidarity action. * All workers in UK to be covered by NAECI Agreement. * Union controlled registering of unemployed and locally skilled union members, with nominating rights as work becomes available. * Government and employer investment in proper training / apprenticeships for new generation of construction workers – fight for a future for young people. * All Immigrant labour to be unionised. * Trade Union assistance for immigrant workers – including interpreters – and access to Trade Union advice – to promote active integrated Trade Union Members. * Build links with construction trade unions on the continent. However, there is no way around the fact that there has been a continous nationalist dimension to these strikes. Even the seemingly progressive demands of the Lindset strike may hide a more sinister nationalism. What exactly does ‘locally skilled union members’ mean? One thing that the left needs to sort out is its understanding of the economic significance of immigration. We need to be able to give honest answers about what immigration means. A good place to start for this is to have a look at a very easy to read article by George Borjas, perhaps the worlds leading labour economist and almost certainly the world leader on the economic significance of immigration. Anyway the article is here and is well worth a look to catch up on the state of knowledge in the field.